HUNTERS POINT — Citi Bike has finally made it to Queens. Officials opened the first station of the bike share program in Long Island City Wednesday morning, one of 12 that will be installed in the area in the coming weeks and part of a larger plan to double the city's Citi Bike fleet by 2017. The first docking station in Hunters Point is now open at Center Boulevard between Borden and 54th avenues, a location that will likely appeal to riders looking to catch the nearby East River Ferry or pedal over the Pulaski Bridge into Brooklyn. "It's going to be great to have Citi Bike here," said Frank Raffaele, owner of outdoor cafe LIC Landing, located just across the street from the new bike share station. "On weekends, the ferry is essentially full of tourists," he said, saying the waterfront serves as the "gateway to Queens," and that Citi Bike will help visitors explore other parts of the neighborhood. "This will be an opportunity for them to sort of venture away from the waterfront," he said. Other docking stations to be installed this month include one near the Vernon Boulevard-Jackson Avenue 7 train station, on Jackson Avenue near MoMA PS 1, near the Citigroup Building in Court Square, in Queensboro Plaza and on 21st Street across from the Queensbridge Houses. Citi Bike was initially supposed to launch in Long Island City during the program's rollout in 2013, but its was delayed after equipment was damaged by flooding during Hurricane Sandy. Local elected officials have been pushing to bring it to the neighborhood since. 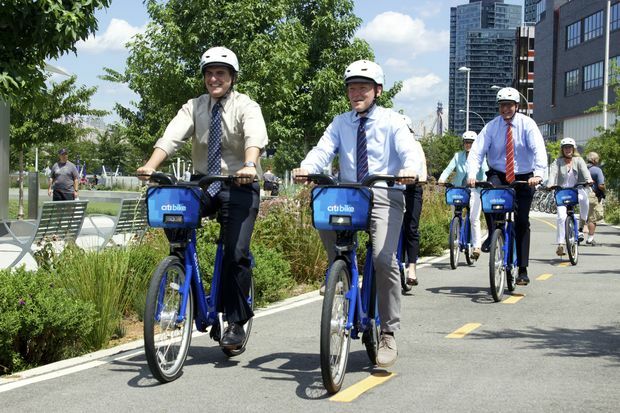 "This has been a more than three-year odyssey," said City Councilman Jimmy Van Bramer, one of several officials who rode the borough's first bikes from Brooklyn to Queens Wednesday morning. New stations will also be installed this month in Greenpoint, Williamsburg and Bedford-Stuyvesant, officials said. The program will expand to the Manhattan's Upper West Side and Upper East Side this fall. Even more neighborhoods are slated to get the blue bikes by the end of 2017, including Harlem, Astoria, Cobble Hill, Red Hook, Crown Heights, Boerum Hill, Park Slope, Gowanus, Carroll Gardens and Prospect heights. All of Citi Bike's existing docking stations and software were upgraded this spring to make the system more reliable, according to Jay Walder, head of Motivate, the company that runs Citi Bike. The company has also improved the Citi Bike app that lets users see what stations have bikes. Cyclists have taken more than 20 million trips on Citi Bikes since the program launched in 2013, he said. "New Yorkers love Citi Bike," Walder said. "It's transformed the way we get around. Now we'll see the real potential of Citi Bike as it moves out to more communities, and more New Yorkers can experience the freedom of bike share."